G Shivashekar SRM Medical College Hospital & Research Centre, Potheri, Chennai, Tamil Nadu, India. Hemalatha Ganapathy Sree Balaji Medical College & Hospital, Chennai, Tamil Nadu, India. Aruna . SRM Medical College Hospital & Research Centre, Potheri, Chennai, Tamil Nadu, India. Geetha . SRM Medical College Hospital & Research Centre, Potheri, Chennai, Tamil Nadu, India. Background: Fine needle aspiration cytology (FNAC) is an accurate, cost effective & safe technique for diagnosing salivary gland lesions. We conducted this study to observe the cytological spectrum of different salivary gland lesions in tertiary care hospitals. Methods: This is a prospective study carried from June 2010 to April 2014 at SBMCH Chromepet and SRM MCH & RC, Potheri. Fine needle aspiration was performed on patients presenting with complaints of salivary gland lesions. Data was statistically analyzed. Result: FNAC is performed on total of 135 salivary gland lesions. 11 were non diagnostic aspirate (8.2%), 58 were non neoplastic lesions (42.9%) and 66 were neoplastic lesions (48.9%). The most common benign tumor of salivary gland is pleomorphic adenoma and mucoepidemoid carcinoma was the most common malignant tumor. The most common major salivary gland involved is parotid gland. Conclusion: In the present study, neoplastic lesions were more common than non-neoplastic lesions. We conclude that inspite of few diagnostic pitfalls FNAC still plays a vital role in differentiating neoplastic from non- neoplastic salivary gland lesions to provide guideline for appropriate patient management. KEYWORDS: Cytology, FNAC, Salivary Gland, Neoplastic Lesion, Non-Neoplastic Lesion. 1. Orell SR, Kilijanienko J. Head and Neck; Salivary Glands. In : Orell SR, Sterrett GF, eds. Orell and Sterrett's Fine Needle Aspiration Cytology. 5th ed. Edinburg: Churchill Livingstone; 2012:53-77. 2. Mihashi H, Kawahara A, Kage M, Kojiro M, Nakashima T, Umeno H, Sakamoto K, Chiziwa H, Kurume. Comparison of preoperative fine-needle aspiration cytology diagnosis and histopathological diagnosis of salivary gland tumors. Med J. 2006; 53(1-2):23-7. 3. Jayaram G, Verma AK, Sood N, Khurana N. Fine needle aspiration cytology of salivary gland lesions. J Oral Pathol Med. 1994 Jul; 23(6):256-61. 4. Wada E, Kounoike Y, Kinoshita Y, Ohashi I, Yuba Y, Kobashi Y. Fine needle aspiration cytology of salivary gland. J Jpn Soc Clin Cytol. 2004;43:155–60. 5. 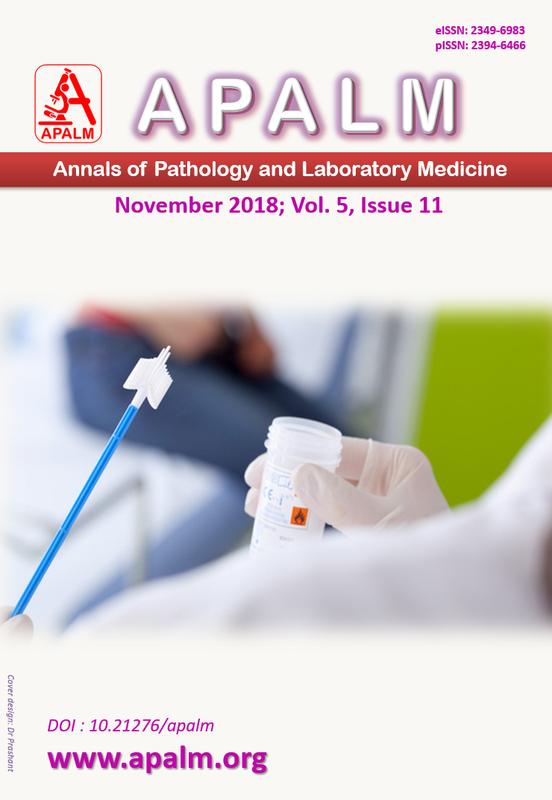 Nguansangiam S, Jesdapatarakul S, Dhanarak N, Sosrisakorn K. Accuracy of fine needle aspiration cytology of salivary gland lesions: routine diagnostic experience in Bangkok, Thailand. Asian Pacific Journal of Cancer Prevention. 2012;13(4):1583-8. 6. Tan LG, Khoo ML. Accuracy of fine needle aspiration cytology and frozen section histopathology for lesions of the major salivary glands. Annals of the Academy of Medicine Singapore. 2006;35(4):242-8. 7. Akbaş. Y, E. U. Tuna, A. Demireller, H. Ozcan, and C. Ekinci, “Ultrasonography guided fine needle aspiration biopsy of parotid gland masses,” Kulak Burun Bogaz Ihtisas Dergisi, 2004;13:15–18. 8. Pratap. R, Qayyum, Ahmed, Jani, and Berman LH, “Ultrasound-guided core needle biopsy of parotid gland swellings,” Journal of Laryngology and Otology, 2009;123:449–452. 9. Rajwanshi A, Gupta K, Gupta N, Shukla R, Srinivasan R, Nijhawan R, Vasishta R. Fine-needle aspiration cytology of salivary glands: diagnostic pitfalls--revisited. Diagn Cytopathol. 2006 Aug; 34(8):580-4. 10. Ashraf A, Shaikh AS, Kamal F, Sarfraz R, Bukhari MH. Diagnostic reliability of FNAC for salivary gland swellings: a comparative study. Diagn Cytopathol. 2010 Jul; 38(7):499-504. 11. Vaidhya S, Sinha A, Narayan S, Adhikari Sabira. A comparative study of fine needle aspiration cytology and histopathology in salivary gland lesions. JPN, 2011; 1:108-113. 12. Dhanalakshmi M, Lakshmana Rao, Krishnaswamy, Manohar, Gopalakrishnan, Aruna. Fine needle aspiration cytology and histopathology of salivary gland lesions: A correlative study in rural teaching hospital. JCCM 2009; 12: 674 – 680. 13. Akhter J, Hirachand S, Lakhey M. Role of FNAC in the diagnosis of salivary gland swellings. KUMJ 2008; 6: 204 – 208. 14. Aruna S, Prathiksha Pai, Shreekant K. Kittur. Cytomorphological study of major salivary gland lesions: a 5-year experience at a tertiary care center. Medica Innovatica. 2016;5 (1):13-19. 15. Ameli F, Baharoom A, Md Isa N, Noor Akmal S. Diagnostic challenges in fine needle aspiration cytology of salivary gland lesions. Malays J Pathol 2015 Apr 37(1): 11-8. 16. Verma S. Fine needle aspiration cytology of salivary gland lesions: study in a tertiary care hospital of North Bihar. Int J Res Med Sci 2016;4:3869-72. 17. Sengupta Sengupta S, Roy A, Mallick et al. FNAC of salivary glands. Indian J Otolaryngol Head Neck Surg 2002;54:184-8. 18. Masanja MI, Kalyanyama BM and simon ENM. Salivary gland tumors in Tanzania. East African Medical Journal 2003; 80 (8): 429 – 431. 19. Sunida R, Jongkolnee settakorn, Ponsak Mahanupab. Salivary gland tumours in Maharajnakorn Chiang Mai Hospital : A retrospective study of 198 cases. CMMB 2006; 45(2): 45-53. 20. Flavia A. Salivary gland tumor: A review of 599 cases in a Brazialian population. Head and neck pathol, 2009; 3: 271 – 275. 21. Muhammed Isa Kara, Fahrettin goze, Seref ezirganh, Serkan polat. Neoplasms of the salivary glands in a Turkish adult population.Med Oral Pathol Oral Cir Bucal, 2010; 15(6): e880 – 885. 22. Kotwal M, Gaikwad S, Patil R, Munshi M. Fnac of salivary gland- a useful tool in preoperative diagnosis or a cytopathologist’s riddle. Journal of cytology. 2007;24(2):85-8. 23. Iqbal M, Anwar K, Ihsanullah, Mohammad J khan IA, Hussain G. The diagnostic value of FNAC in masses of salivary glands. JPMI 2011; 25: 73 – 77. 24. Das K Dilip, Petkar A Mahir, Al Mane M Nadre, Sheik A Zafar and Malik K Mrinmay. Role of fine needle aspiration cytology in the diagnosis of swellings in the salivary gland regions: A study 712 cases. Med Princ Pract 2004; 13: 95 – 106. 25. Edmund S.Cibas, Barbara S. Ducatman. Cytology – diagnostic principles and clinical correlates. 3/e. 2008: 285-318.